Type M for Murder: Recreating Sherlock and Having Fun With It. Now that I’ve switched my focus from darker, grittier crime novels (standalones like More than Sorrow, the eight novels in the Constable Molly Smith series) to cozies, my only aim as a writer is to have fun with it. 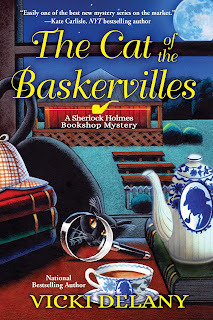 And I’m having a lot of fun with the Sherlock Holmes Bookshops series, in which the third, The Cat of the Baskervilles, came out this week. There isn’t much hotter in the world of popular culture today than Sherlock Holmes. The continuing popularity of the original books by Sir Arthur Conan Doyle; the massive number of modern short story collections and pastiche novels; two TV series, several movies. I’m a writer and I’m also a keen mystery reader. So when I was looking for inspiration for a new series, I thought a bookstore would be fun. 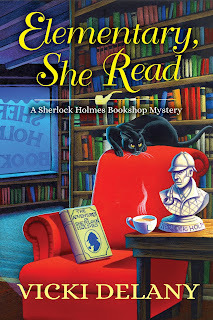 And then the idea popped into my head: A bookstore dedicated to Sherlock Holmes. When I started to do some research on that, I quickly discovered it’s not such an unfeasible idea. You could easily stock a store with nothing but Sherlock. Not only things I mentioned above but all the stuff that goes with it: mugs, tea towels, games, puzzles, action figures, colouring books, cardboard cut-out figures. The list is just about endless. Throw in nonfiction works on Sir Arthur and his contemporaries, maybe a few books set in the “gaslight” era. And, presto, a fully stocked bookstore. And thus was born the Sherlock Holmes Bookshop and Emporium. Because cozy lovers (and me) love food to go with their reading, I put Mrs. Hudson’s Tea Room next door, run by her best friend Jayne Wilson. 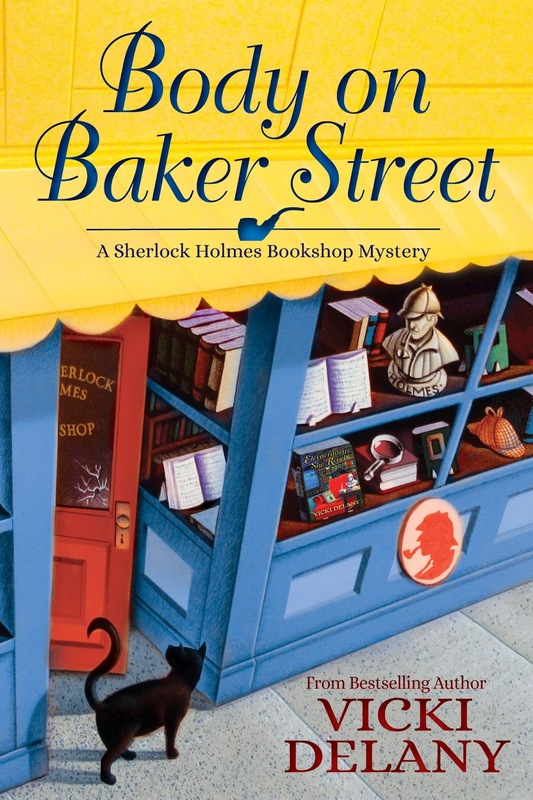 Every book and every piece of merchandise sold in the Sherlock Holmes Bookshop and Emporium exists in the real world (with one exception as readers of Body on Baker Street will understand). I haven’t read all the books I mention, and I’m not necessarily recommending them, but I enjoy dropping the names of books into the story as customers browse and shop and ask Gemma for suggestions: something suitable for a middle aged man laid up after falling off the roof; a book for a friend who loves historical mysteries; a YA with a female protagonist; even a hostess present for a hated mother-in-law! My original intent when I began the series, was that the main character would be a normal cozy character. A nice young woman who owns an interesting bookshop, lives in a pleasant community (in this case, on Cape Cod), and has a circle of friends. But, by the time I got to page 2, Gemma Doyle had become “sherlockian”. And that’s been enormous fun to write. Gemma has the amazing memory (for things she wants to remember), and incredible observational skills, and a lightning fast mind. She is also, shall we say, somewhat lacking on occasion in the finger points of social skills. Jayne is ever-confused, but loyal. “It was perfectly obvious,” I said. “I smelled flour, tea, and sugar the moment we came in. Those are normal scents in anyone’s house, but tonight they’re of a strength that indicates they’ve been recently dumped from their containers. Overlaid with the odor of rotting vegetables, by which I assume the fridge door has been left open. I keep meaning to eat that kale because it’s supposed to be healthy, but I really don’t care for it. “Enough, Gemma,” Jayne whispered to me. “I only want to point out the obvious facts.” I’ve been told on more than one occasion that some people don’t understand my attention to detail and thus misunderstand the conclusions I draw from it. I have tried to stop, but I might as well stop thinking. And this didn’t seem like a suitable time in which to stop thinking. I was about to inform her that I never guess, but Jayne elbowed me in the ribs. Sherlock Holmes and John Watson, reimagined as modern young women just trying to get on with life. Oh, the Sherlock Holmes Bookshop (with Mrs Hudson's tea room next door)series sounds great fun to read and write!